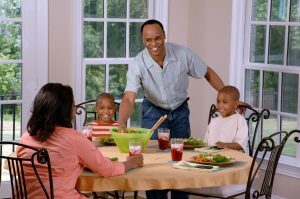 Food Assistance helps families stretch their food budgets to buy healthy food. The program is designed to increase nutritional levels and safeguard the health and well-being of Hamilton County residents. Benefits are distributed on a “Ohio Direction Card” which can be used like a debit card at the grocery store. Healthy people under 60 also participate in Food Assistance Employment and Training (FAET) while receiving food assistance to help them gain work experience and move toward self-sufficiency. Ultimately, food assistance helps families meet their basic needs while adults work toward financial stability. Food Assistance (formerly known as the food stamp program) is known nationally as the Supplemental Nutrition Assistance Program. Eligibility for food assistance is complex – based on family size, income and expenses – but both families and individuals may be eligible to receive food assistance. You may qualify for benefits if your household’s gross monthly income is at or under 130 percent of the federal poverty guidelines. Some households may qualify if they have incomes over the limit if someone in the household is elderly or disabled. To get a better idea of if you may qualify, use the USDA’s food assistance calculator or apply for food assistance.